A quit claim deed is used to transfer ownership of real estate from one person or party to another. Quit claim deeds are most often used to transfer ownership of property when the property is conveyed as a gift. They are commonly used by family members to transfer real estate when a warranty deed is not needed. Our free quit claim deeds prohibit the GRANTOR – the person transferring the property – from trying to claim interest in the property. When signing a quit claim deed the GRANTOR “quits” his or her interest, thus relinquishing ownership in the property. A quit claim deed protects the GRANTEE – the person receiving the property. These deeds are very important when transferring ownership of property after a death or a divorce. 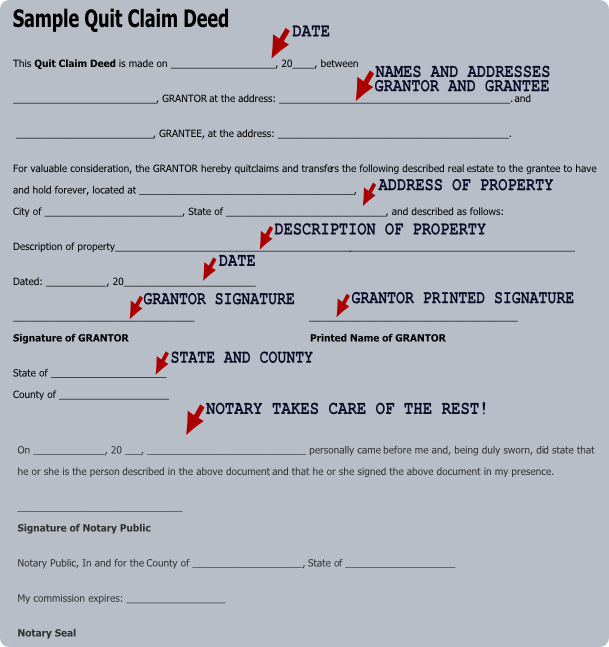 All that is needed when filling out a quit claim deed form is the names of the GRANTOR and GRANTEE, their addresses, a full description of the property in question and everyone’s signature. Once completed, to be valid, your quit claim deed must be signed and sealed in the presence of a notary. and that he or she signed the above document in my presence.